Antibiotics for use in animals are regulated by the Fertilizers, Farm Feeds, Agricultural Remedies and Stock Remedies Act (Act 36 of 1947), administered by the Department of Agriculture, Forestry and Fisheries; and the Medicines and Related Substances Control Act (Act 101 of 1965), administered by the National Department of Health (NDoH). Antibiotics intended for use by the lay public (chiefly farmers) are registered under Act 36 as stock remedies and are available over the counter. Because veterinarians were scarce when Act 36 was promulgated, farmers had to have access to remedies for common ailments affecting livestock. Stock remedies are intended for use by untrained consumers, and the only antibiotics that are registered under Act 36 are those that have been shown to be efficacious when used for specific conditions by such a person, as well as being safe for both the person administering the antibiotic and the animal that is treated. Veterinary medicines are controlled by the Medicines and Related Substances Control Act (Act 101), which primarily controls human medicines. Antibiotics intended for use in animals and registered under Act 101 may only be administered or prescribed by a veterinarian. This situation has led to some anomalies. The older antibiotics, such as tetracyclines, which are also used for tick-borne protozoal infections, may be registered, depending on the formulation, both as stock remedies and veterinary medicines. Stock remedies are freely available, and no record is kept of their use. Veterinary medicines are under the control of veterinarians, who follow guidelines laid down in the veterinary regulations. Most newer antibiotics, which are also used in human health, fall under Act 101 and are controlled by veterinarians. Fig. 1 is a simplified version of the supply chain for veterinary prescription-only antibiotics.2 Veterinarians may administer the antibiotic directly or prescribe and dispense the medicine to the client, who can also obtain the antibiotic from a veterinary wholesaler or distributor. Veterinarians can dispense medicines without a dispensing licence, but are subject to legislation determining the conditions of use of medicines in animals. Over-the-counter antibiotics (stock remedies) are subject to quality control inspections, must be registered for sale, and are distributed to veterinary wholesalers, distributors, farmers' co-operatives, feed mix companies or veterinarians by the manufacturer. Farmers can purchase the stock remedy based on its required indication without a prescription. 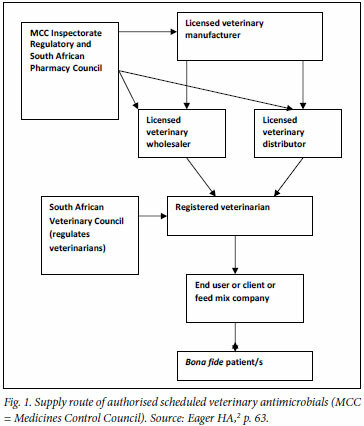 South Africa has several deficiencies when compared with the 1998 World Health Organization (WHO) best practice systems: (i) the dual system of regulating veterinary products only partially addresses clear, transparent manufacturing requirements (while antibiotics listed under Act 101 must be authorised with a Good Manufacturing Practice (GMP) licence, stock remedies under Act 36 are not); and (ii) most authorised veterinary antibiotics are over-the-counter stock remedies and often administered by farmers. The WHO recommends that only trained and licensed professionals decide when and how to use antibiotics. Data on the volume of antibiotics used in livestock production are scarce in South Africa, and information is lacking about the patterns of antibiotic consumption in food animals. Because antibiotic use in animals is controlled by two very different Acts, and because pharmaceutical companies protect sensitive information, it is very difficult to obtain an accurate estimate of the amount of antibiotics used in livestock production. The percentage of antibiotic used for non-food-producing animals, such as pets and horses, is also unknown. A study found that mean antibiotic sales per year from 2002 to 2004 were 1 538 443 kg of active ingredient2 (and H A Eagar, G E Swan, M van Vuuren - personal communication). 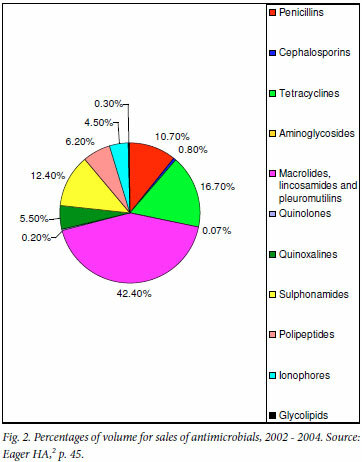 Macrolides and pleuromutilins constituted the majority, followed by tetracyclines, sulphonamides and, lastly, penicillins (Fig. 2). All the classes were authorised for use in food animals, including growth promoters such as ionophores, macrolides, quinoxalines, polypeptides, streptogramins, glycolipids, oligosaccharides, phosphonic acids and polymeric compounds, all of which have been banned from use in the European Union. In South Africa, 29% of all available antimicrobials were in the form of premixes, and represented a large percentage of all the registered antimicrobials. Chloramphenicol and the nitrofurans were the only types of antimicrobials not available for food animals. The greatest volume of antibiotic use is in intensively farmed poultry (including broilers for meat and layers for eggs) and pigs. These animals are kept indoors at a high density, which promotes the rapid transmission of bacterial infections, primarily affecting the respiratory and intestinal tracts. Feedlot cattle and dairy cows are the next group in terms of the amount of antibiotics used. Slaughter cattle are generally raised under extensive conditions on farms, and then sent to a feedlot for rounding off before going to the abattoir. Feedlot cattle are prone to respiratory disease, caused by Mannheimia (Pasteurella) haemolytica, Pasteurella multocida, Histophilus (Haemophilus) somni and Mycoplasma, and mastitis, usually caused by Staphylococcus aureus. Other ruminants (sheep and goats) are extensively farmed, together with the bulk of the population of cattle in South Africa. The main source of food is veld grass, and the density levels are low. Extensively kept ruminants are far healthier than those kept under intensive conditions, and suffer from far fewer bacterial infections. South Africa is drought-prone and there are few aquaculture ventures. Fresh water farms for trout are only found in the Lydenberg, Drakensberg and Western Cape areas. Suitable rivers are scarce and, where a river is capable of supporting farmed fish, there may be more than one farm on the river. Downstream farms can become infected with bacteria from fish farms in the upper reaches. Marine aquaculture ventures are also scarce, considering the extensive coastline of South Africa. There are a few abalone farms in the Hermanus area, and along the West Atlantic coast a total of 8 at present. The water flow rate in an abalone farm is too rapid for antibiotic administration. Ornamental fish are mostly imported, and little breeding is carried out in South Africa. The most frequent uses of antibiotics by weight (as measured by sales) were for treating and preventing diseases in poultry and pigs, and as growth promoters generally.2,3 Tylosin, one of 4 growth promoters banned in Europe, was the most extensively sold antibiotic in the survey. It is primarily administered through animal feed at sub-therapeutic levels and is available as an over-the-counter stock remedy. About two-thirds of the antibiotics surveyed were administered in feed. The second-, third-and fourth-largest groups of antibiotics sold in the study - tetracyclines, sulphonamides and penicillins - are also readily available and have a wide spectrum of antimicrobial activity against common infections. The volume of antibiotics used for treating and preventing disease is unknown and difficult to assess. Intensive farming systems have a rapid turnover rate, and profit margins are generally low. Infectious diseases have a negative effect on profitability, but the high cost of administering antibiotics to all the animals in the barn (metaphylaxis, i.e. sick as well as healthy animals, or prophylaxis, where antibiotics are given to prevent disease before it occurs) also affects profitability. Chronically ill animals are usually culled and not treated. Few recent surveys and reports about antibiotic resistance in isolates from animals in South Africa have been carried out. The studies are small and clustered in the Johannesburg and Pretoria area, and vary in choice of antibiotics tested and other parameters. We review them here, but cannot draw firm conclusions. In a limited number (varying from 1 - 8 isolates per antibiotic tested) of Escherichia coli isolates from poultry, 2/7 (28.6%) were resistant to chloramphenicol and 4/6 (66.6%) to avoparcin (related to vancomycin).3 Since the 1990s, neither antibiotic has been allowed in food-producing animals in South Africa. Less than 20% were resistant to amoxicillin, fluoroquinolones and the aminoglycosides. Oguttu et al.4 (2008) reported on drug resistance in E. coli isolated from broilers raised on feed containing antimicrobials and from poultry abattoir workers. Isolates from broilers carried an exceptionally high level of resistance to tetracyclines (98%), fluoroquinolones (75.6%) and sulphonamides (78.7%). The levels of resistant E. coli from abattoir workers were only slightly higher than those isolated from the general population, and these were lower than the resistance levels of broiler-derived E. coli. Although cephalosporins are not used in poultry, 39.9% of the broiler E. coli isolates were resistant to ceftriaxone, which may be due to the transfer of a multidrug-resistant plasmid, or to extended-spectrum beta-lactamase (ESBL) production. Neither possibility was examined in the study. Picard5 (2010) reported that E. coli isolates from poultry were resistant to amoxicillin and trimethoprim-sulpha combinations (60%), tetracyclines (95%) and enrofloxacin (40%). Geornaras and von Holy6 (2001) found high resistance to tetracycline in all S. aureus and some Listeria species (not L. monocytogenes) and Salmonella (except Salmonella enteritidis) isolates from a poultry abattoir and no resistance to danofloxacin. Antibiotic resistance in Campylobacter jejuni isolated from chicken abattoirs in KwaZulu-Natal was high (>95%) for tetracyclines and ceftriaxone.7 Broiler isolates were resistant to ciprofloxacin (9%), as were 24% of the isolates from layers. C. jejuni isolates from layers were also more likely to be resistant to gentamicin (19%) than those from broilers (2%). In this survey, about 45% of C. jejuni isolates were resistant to erythromycin, ampicillin and nalidixic acid. Jonker8 (2009), regarding C. jejuni and C. coli isolates from pigs and poultry (broilers), showed that C. jejuni tended to show more resistance than C. coli. C. jejuni isolates from Gauteng showed 95.5% resistance to tetracylines, and those from the Western Cape, 70% resistance. Resistance to amoxicillin was 82.4% and to ceftiofur 94.4% in C. jejuni from Gauteng. Resistance was also found to macrolides (especially in pig isolates) and fluoroquinolones (especially in poultry isolates). Of S. aureus and other species of Staphylococcus isolated from mastitis in cattle, >60% were resistant to penicillin and amoxicillin, and >40% were resistant to tetracyclines. Levels of resistance were far lower in the South African National Veterinary Surveillance and Monitoring Programme for Resistance to Antimicrobial Drugs (SANVAD) 2007 surveillance, where only 10% resistance to the 3 antibiotics was found.1 Far less resistance was noted to other commonly used mastitis remedies. In contrast, about 80% of S. pseudointermedius isolates from pyoderma and other infections in dogs were resistant to amoxicillin, and about 20% were resistant to first-generation cephalosporins.3 Petzer et al.9 (2007) found resistance rates of 45% for penicillin, 37% for ampicillin, and 23% of tetracyclines in S. aureus isolates from milk. SANVAD monitors antimicrobial resistance in the country. The programme is the result of an appeal made by the Office International des Épizooties (OIE) to member countries to establish national programmes for managing antimicrobial resistance.1 The OIE Regional Commission for Africa, at their 14th Conference in 2001, appealed to member countries to actively promote the prudent use of antimicrobials in animals and to establish national programmes for the management of antimicrobial resistance. To develop and standardise a surveillance and monitoring programme in South Africa, a research proposal was submitted to the National Research Foundation (NRF) for funding under the Bilateral South Africa-Sweden Scientific Collaboration Agreement. Funding resulting from this application provided the resources to set up a network of participating laboratories and to provide training to laboratory technologists. In accordance with the OIE guidelines, South Africa's surveillance programme is based on 3 categories of bacteria: indicator bacteria, zoonotic bacteria and animal pathogenic bacteria. These categories provide the best opportunities to detect resistance where selective pressures are applied, carrier animals of zoonotic bacteria are treated, and clinically ill animals are treated, respectively. The results of the 2007 SANVAD surveillance yielded levels of resistance that were generally higher than those reported in Europe for E. coli and Enterococcus. E. coli showed a 67% resistance to one or more commonly used antimicrobials, especially tetracyclines, fluoroquinolones and sulphonamides.1 Poultry and pigs showed the highest levels of resistance, and commensal strains of E. coli showed higher rates of resistance than those associated with disease. This is probably due to prophylaxis or metaphylaxis. Resistance levels in Enterococcus isolates were particularly high for tetracyclines, sulphonamides and neomycin. E. faecalis showed less resistance (12.5%) to vancomycin than did E. faecium (20%). S. enterica showed resistance to tetracyclines and sulphonamides, and isolates from pigs also to chloramphenicol. The general levels of resistance were similar (except for pig isolates) to those quoted from most countries, except Sweden, where a concerted effort in eradicating Salmonella is reflected in a far lower resistance pattern in isolates. The principle of vaccination against bacterial diseases is firmly entrenched in agriculture in South Africa. Most farmers greatly prefer an effective vaccine to using antibiotics. One of the first veterinarians in South Africa, Arnold Theiler, founded the Onderstepoort Veterinary Institute and its main focus has always been the development and production of vaccines. Onderstepoort produces an extensive list of vaccines, and many imported vaccines are also available. Many of these vaccines are registered under the Stock Remedies Act 36, and are therefore freely available for laymen to use. Most available vaccines are very cost-effective, which also makes them an attractive prospect for farmers. Worldwide and in South Africa, veterinary medicine for treating food animals is changing profoundly.10 Veterinarians are perceived by the public as possessing a narrow set of skills focused on treating companion animals that are ill or injured. The number of veterinarians required for primary health care on farms is decreasing because of an increased focus on preventive medicine. The need for veterinarians specialised in preventive medicine in food-producing animals is increasing. These encompass all segments of food production systems, environmental management, bio-security, disease eradication, laboratory diagnostics and regulatory bodies. This situation should change the way in which veterinary students are recruited and trained, although all South African veterinarians are already conversant with the basic principles of preventive medicine. There are few large hospitals for animals in South Africa. Apart from the academic hospital at the Faculty of Veterinary Science at Onderstepoort, and those associated with charitable organisations, all the others are in private hands as part of a veterinary practice. The practice owners have a vested interest in keeping infection levels low. Veterinary practices are registered by the Veterinary Council, and they and their associated hospitals are regularly inspected by veterinarians designated by the Veterinary Council. The basic principles of infection control in the practice form part of the inspection. Extensively farmed animals are usually treated on the farm of origin, and there is no standard for the facilities provided by the farmer. The animal may be treated in a field, a crush or a stable. Infection control under these circumstances is in the hands of the veterinarian, who has to educate the farmer if necessary. A common intensive farming practice in South Africa is the 'all in, all out' system. The entire barn or house is filled with animals of a similar age which are then grown out to slaughter age or, in the case of layers, to the stage when they no longer produce eggs profitably. All the animals are then sent for slaughter, and the barn is depopulated, cleaned, disinfected and left empty for a week or two. This strategy decreases the build-up of resistant bacteria in a population of intensively kept food animals. Biosecurity on farms is another strategy. Control of visitors to a farm, showering and changing clothing before and after entering animal houses, disinfection of lorries delivering feed, good fences properly maintained, and the quarantine and testing of newly introduced animals are all part of a farm's infection control measures. Dairy cattle pose a special problem. Cows are bred throughout the year, to ensure a continuous supply of milk. Milking parlours are expensive to build, and so there is usually only one parlour on a farm. Cows are usually milked twice a day, but high-producing cows are milked 3 times a day. These factors make infection control difficult, as the milking parlour is only empty for a few hours between the end of one milking and the next, every day of the year. There are continuous deliveries of feed and other supplies, as well as collections of milk, which complicates biosecurity measures. Cows also need to be kept in small camps close to the milking parlour, as they cannot walk long distances twice a day to the parlour and back to the grazing. The supplier of fresh milk is paid a premium for milk with a low bacterial load, even though milk in South Africa is pasteurised before bottling. This ensures that the dairy producer implements effective hygienic principles and, as each batch of milk is usually tested for contamination, there is continuous monitoring of hygiene on the farm. This has an effect on infectious agents as well, and contributes to mastitis control. Milk used for other purposes, such as the preparation of dried milk powder, is subjected to far lower requirements, and farmers are also paid far less for their milk. Hygiene may be a problem on such farms.